A closet nearly overflows with items for needy families at the Hope Center for this holiday season. Hope Center officials are asking residents to provide gifts suitable for teenagers this Christmas. 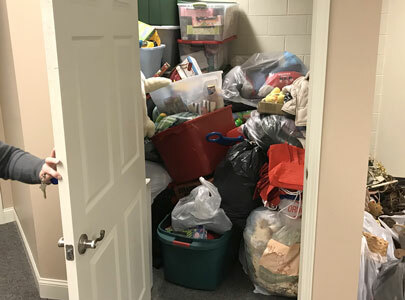 As another wintery holiday season approaches, the Hope Center is again looking for donation items to help brighten up Christmas for needy residents. Lorie Spain, Hope Center director of Compassion Ministries, said the facility tries not to duplicate care already offered elsewhere in the community. While the Care Train is geared toward younger children, Spain said her organization is looking for gifts and items for teenagers. Among the center’s offerings is a Christmas store for people who have volunteered at the Hope Center. Those who volunteer gain Hope bucks, which can then be used to purchase items from the organization’s Christmas store. That store is open on Dec. 17 and 18. Spain said the Christmas store program is important. She said those families who volunteer can complete a form listing what they need, and Spain tries to make sure those items are in the store when the family arrives. The center also offers the chance to adopt a family for the holidays. She said this program can help single-parent families who are busy and need a helping hand. “What they need is to just be blessed,” Spain said. Organizations or individuals can contact the Hope Center to adopt a family. The center then pairs them with a family and the sponsor takes care of the items requested by the adoptee. Spain said if people need Christmas assistance, they can contact the Hope Center. Spain said she could use volunteers for Dec. 17 and 18 to work in the Christmas store. “We need brand-new toys, and we need teen items,” Spain said. For boys, Spain said items like skateboards and bicycles would be appreciated, while makeup and other beauty items for girls would be welcomed. Spain also noted while the center’s emphasis is on teenagers, it does serve families with younger children who don’t qualify for the Care Train. “They can come with the littles and shop for the littles, too,” Spain said. The center is also looking for hams, turkeys, potatoes and other food items. Residents can drop off items from Dec. 17 to 21. Those items will be used to make the center’s food baskets, which are given to families taking advantage of the center’s food assistance program. Spain said last year saw more than 100 meals handed out. Spain said the center also needs hats, gloves and scarves for adults, and especially adult men. Hand warmers would also be appreciated, she said. According to Spain, the center can also always use lice shampoo. Spain said the center’s in the midst of a “towel drive.” The center offers vouchers for people to go the YMCA to shower. According to Spain, there are only seven towels left for that program. “If people are getting new towels for Christmas, and they want to get rid of their old ones, they can drop them off at the front,” Spain said.